Tasked with using up leftover cranberries and with the goal of creating a beautiful baked brie dish, this Christmas I decided to try sugaring cranberries. The experiment was a huge success! Not only did they pair great with the cheese as an appetizer for Christmas Eve dinner, but everyone enjoyed the leftovers as a snack. The sugar adds just enough sweetness to the tartness of raw cranberries that they become a perfect finger food and a great vitamin-C packed alternative to heavy holiday deserts and snacks. (optional) orange or lemon zest for garnish. 1. In a small saucepan over medium heat, heat the water and sugar, stirring to combine. Add maple syrup and cook over medium heat until sauce is simmering. Do not bring to a hard boil. 3. Pour syrup over berries, stir to coat evenly, and place in the refrigerator for 12-24 hours. 5. 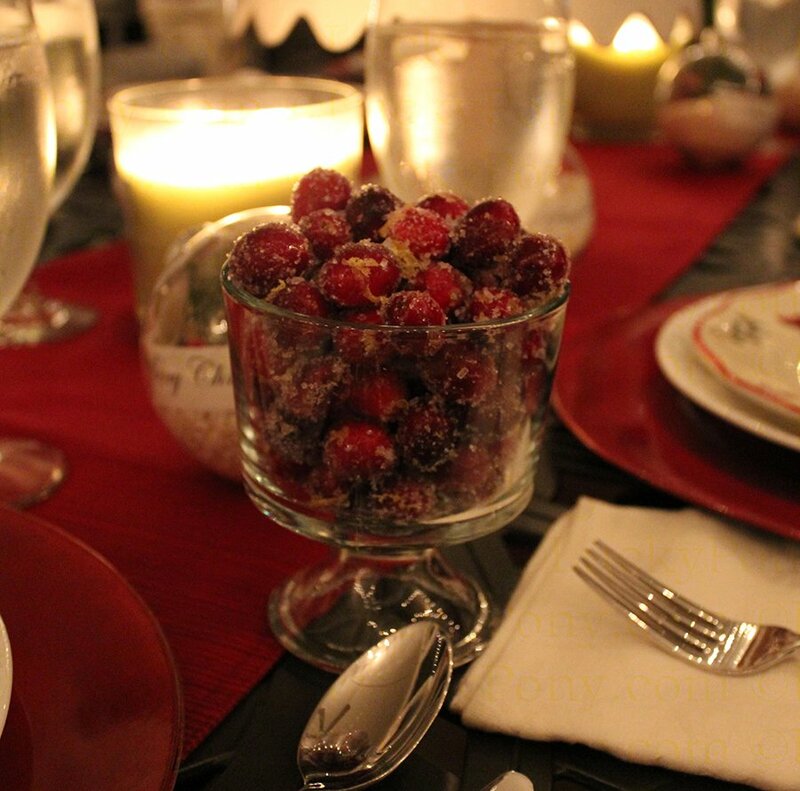 After draining, toss cranberries with the sanding sugar. I use a 9×16 Tupperware- which allows plenty of room for the berries to spread out and all surfaces get coated. 6. Serve as a desert topping or stand-alone snack. Refrigerate unused portion.